To me Indian food is the perfect comfort food. It’s spicy, warming, flavorful and basically combines everything I need on cold winter nights. 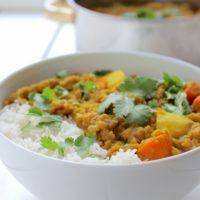 This potato and lentil stew, which is inspired by the Indian Dahl, does indeed warm you from the inside out. Unlike traditional Indian Dahls, this version is quick and easy to make and it always turns out. With this recipe you’ll end up with a few servings, so you basically won’t need to cook the following days. You can reheat the stew within a few minutes and have it with some rice or simply bread (e.g. Indian Naan bread). No wonder, it’s among my favorite meals to take to work. The combination of carbs and protein also gives you lots of energy and prevents you from drowsiness after eating. 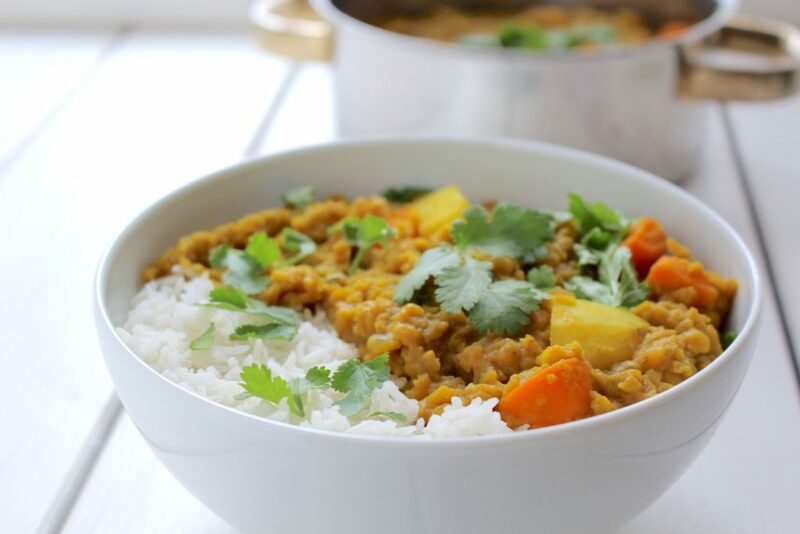 This Indian inspired potato and lentil stew is the perfect comfort food for cold winter nights. It's super flavorful, warming and just satisfying. Add lentils and potatoes to a large pot with about 4-4,5 cups of water (depending on size of potatoes). Add onion, garlic and bay leaves and bring to a boil. Add all the other ingredients except for the salt. Cover the pot with a lid and reduce the heat. Simmer, stirring regularly, for about 30 minutes or until the lentils and potatoes are just tender, adding more water as necessary. Take off the heat and add salt (and any other spices) to taste. Let steep for 10 minutes. Remove bay leaves before serving. Optional: garnish with cilantro and serve with rice or (naan) bread. You could also roast onion, garlic and ginger in a pan with some oil first before adding them to the lentils. You can keep this stew in the fridge for a few days. Or you could freeze individual portions and reheat them in a pot with a splash of water. I hope you love this recipe – please let me know in the comment section below! 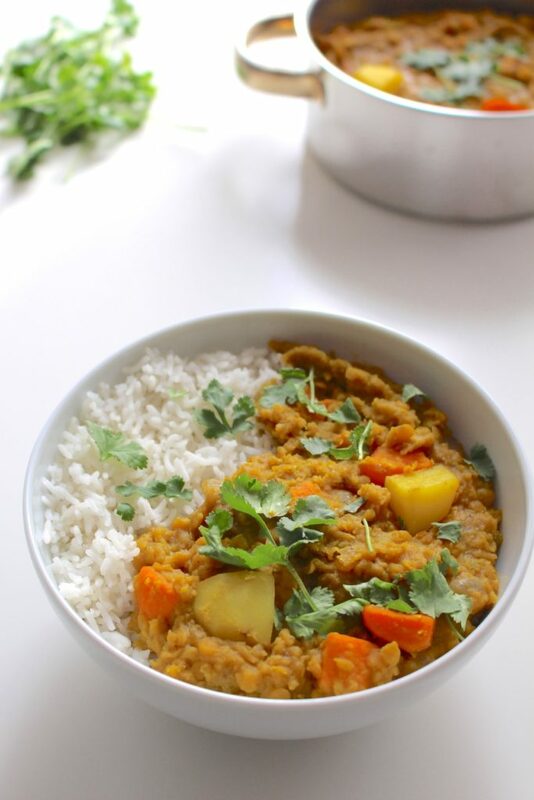 If you make this potato and lentil stew, make sure to take a photo and share it on my Facebook page or on Instagram, using the hashtag #minamadefood. Oh and don’t forget to tag me (@thisisminamade) so that I can see your creations!